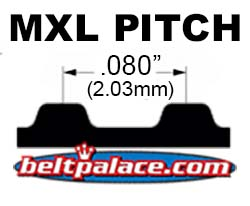 Home > Timing Belts MXL-XL-L-H... > MXL Metric Timing Belts. Trapezoidal Tooth Gear belts - 0.080" Pitch > 140MXL3.2G Timing belt. Industrial Grade 140MXL012. 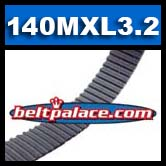 140MXL3.2G Timing belt. Industrial Grade 140MXL012. Toothed Gear Belts marked “140MXL” at 1/8” Width.